Very intolerant fish. A male should be kept together with several females. The aquarium should be decorated with substrate of fine gravel and a lot of rocks that form caves and crevices. They don t dig in the substrate. You should feed them live food. Fish that are born in the aquarium can be accustomed to dry food. Breeding is easy. 20-4- eggs are laid and immediately taken in the mouth by the female. They are fertilized by the male using the dummy egg method. After a week the young fishes leave the mouth of the mother. You can raise them with baby brine shrimp and fine crushed dry food. 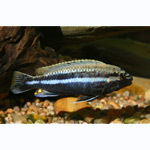 Mbuna Cichlids such as the Cobalt Blue, Electric Yellow Lab, Johanni, Lemon Yellow, Pindani, Red Zebra, Tropheops, and Kenyi. Also synodontis catfish. Too aggressive for Haplochromis and Peacock Cichlids. Start with a small group and let them pair up.